Among the first Japanese maps to include the new 'Territory' of Taiwan. An extremely impressive large scale map of the Japanese Empire dating to 1895 or Meiji 28. 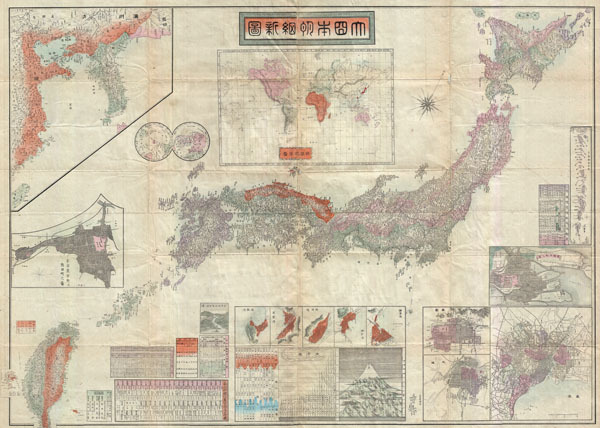 This map was issued shortly after the 1895 Japanese invasion of Taiwan and is consequently one of the first Japanese maps to include Taiwan and Korea as provinces of Imperial Japan. The map also includes various insets focusing on various Japanese cities and important islands. At the base of the map there are various statistical charts as well as a comparative mountains and rivers chart. At the top center three is a world map showing the various continents with Japan itself highlighted in red. Very good. Wear and minor verso reinforcement on original fold lines - particularly at fold intersections.